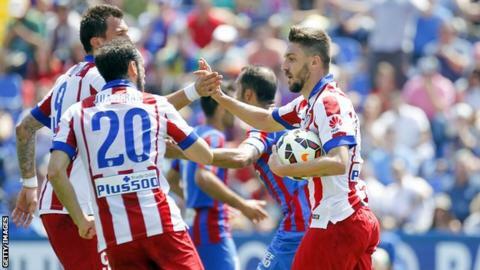 Fernando Torres scored an equaliser 10 minutes from time as Atletico Madrid salvaged a point at struggling Levante. David Barral gave the hosts the lead but Guilherme Siqueira struck back almost immediately in the first half. Kalu Uche put Levante back in front before Torres, on loan from AC Milan, scored a header from Koke's corner. Levante are now five points clear of the relegation places with two games to play, while Atletico can secure a Champions League spot with one win. Diego Simeone's Atletico side play Barcelona, who are one victory away from securing the title, and Granada in their remaining fixtures, subject to the Spanish Football Federation's suspension of all football in the country being lifted. Former Chelsea and Liverpool striker Torres, 31, has scored three league goals in 18 matches since joining from Milan in January. Match ends, Levante 2, Atlético de Madrid 2. Second Half ends, Levante 2, Atlético de Madrid 2. Attempt saved. Fernando Torres (Atlético de Madrid) header from the centre of the box is saved in the centre of the goal. Assisted by Giménez with a headed pass. Dangerous play by Raúl García (Atlético de Madrid). Iván López (Levante) wins a free kick in the defensive half. Substitution, Levante. Andreas Ivanschitz replaces Morales. David Barral (Levante) is shown the yellow card for a bad foul. Giménez (Atlético de Madrid) wins a free kick in the defensive half. Foul by David Barral (Levante). Substitution, Levante. Rafael Martins replaces Kalu Uche. Foul by Fernando Torres (Atlético de Madrid). José Mari (Levante) wins a free kick in the defensive half. Substitution, Levante. José Mari replaces Víctor Camarasa. Attempt saved. Giménez (Atlético de Madrid) right footed shot from the centre of the box is saved in the bottom left corner. Assisted by Miranda with a headed pass. Delay in match Diego Mariño (Levante) because of an injury. Goal! Levante 2, Atlético de Madrid 2. Fernando Torres (Atlético de Madrid) header from very close range to the bottom left corner. Assisted by Koke with a cross following a corner. Delay in match Iván López (Levante) because of an injury. Foul by Raúl García (Atlético de Madrid). Foul by Miranda (Atlético de Madrid). Kalu Uche (Levante) wins a free kick on the left wing. Substitution, Atlético de Madrid. Raúl García replaces Gabi. Miranda (Atlético de Madrid) is shown the yellow card for a bad foul. David Barral (Levante) wins a free kick in the attacking half. Kalu Uche (Levante) wins a free kick on the right wing. Substitution, Atlético de Madrid. Saúl Ñíguez replaces Tiago. Foul by Arda Turan (Atlético de Madrid). David Barral (Levante) wins a free kick in the defensive half. Goal! Levante 2, Atlético de Madrid 1. Kalu Uche (Levante) right footed shot from very close range to the bottom left corner. Attempt saved. Kalu Uche (Levante) left footed shot from very close range is saved in the centre of the goal. Hand ball by Tiago (Atlético de Madrid). Juanfran (Levante) wins a free kick in the defensive half. How did the semi-finalists warm up? Read more on Champions League: How did the semi-finalists warm up?